The Chroma-Notes™ Colored Music System was born during in the process of designing the look of Boomwhackers Tubes. Although the basic system had been proposed in the past, no one was actually using it on instruments or in music notation when Craig Ramsell was developing the tubes in the mid-1990's. This system works with the basic color wheel which is created from the three primary colors: red, yellow and blue. Mix them to get the three colors in between - orange, green and violet - and you have 6 colors. Mix them again to get the in-between colors - red-orange, yellow-orange, yellow-green, etc. 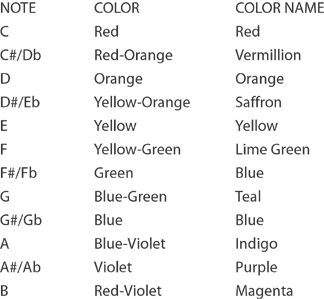 - and the result is 12 colors, exactly the number of notes in a chromatic scale. 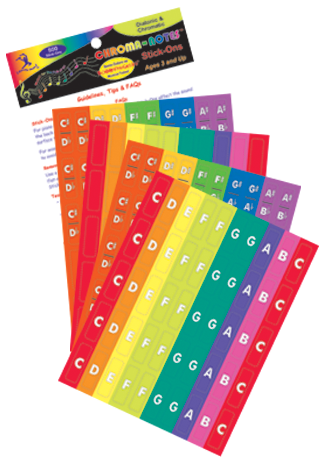 Chroma-Notes Stick-Ons are removable stickers colored to the Chroma-Notes color scheme for color-coding existing instruments such as pianos, xylophones, melodicas, etc., to enable the instruments to be more easily played using colored music charts. The Stick-Ons vastly increase the number of instruments that can benefit from having the colored musical scores. The package contains 500 stickers and the suggested retail is only $10.95! They are available through Rhythm Band Instruments. 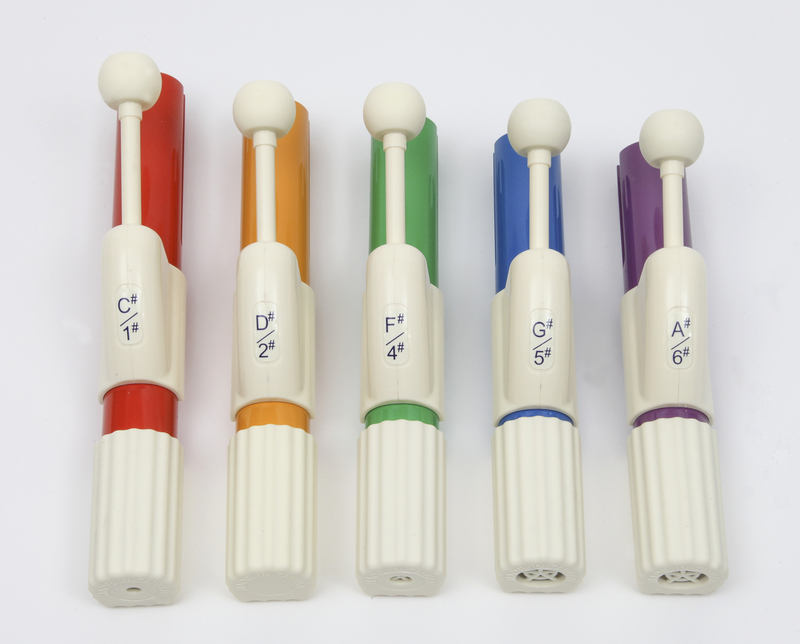 Chroma-Notes Handbells, Choir Chimes, Resonator Bells and Desk Bells Featuring Boomwhackers® Colors! 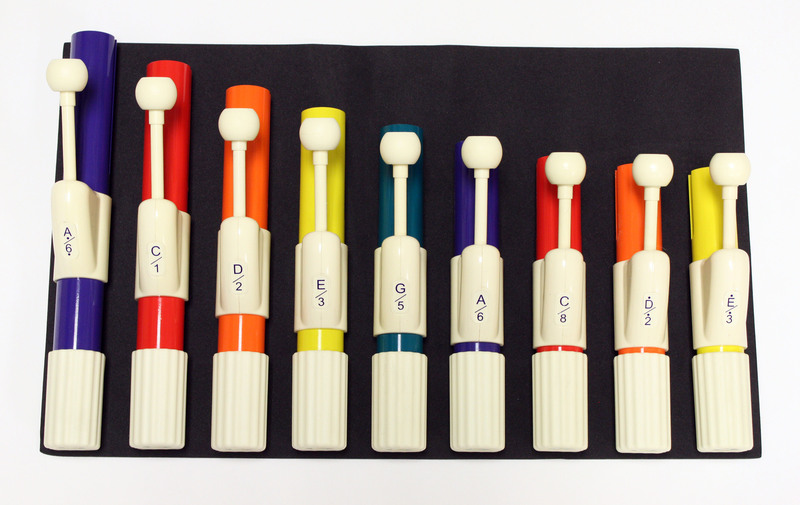 The colors of the Boomwhackers Tubes are based on our patented Chroma-Notes Colored Music System. 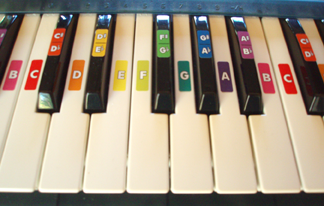 The colors start with “C” being red and essentially proceed through the color wheel as the notes progress through the chromatic music scale. A full chromatic set. Manufactured to the highest standards, the top-quality construction and accurate intonation make these bells the best value available. The Chroma-Notes colors make it more fun to learn and play along with Boomwhackers! Each metal bell is marked with the proper note and number to help children learn the musical scale. Five inches tall, the long handles enable players to grasp the bells securely. Manufactured to the highest standards, the top-quality construction and accurate intonation make these bells the best value available. 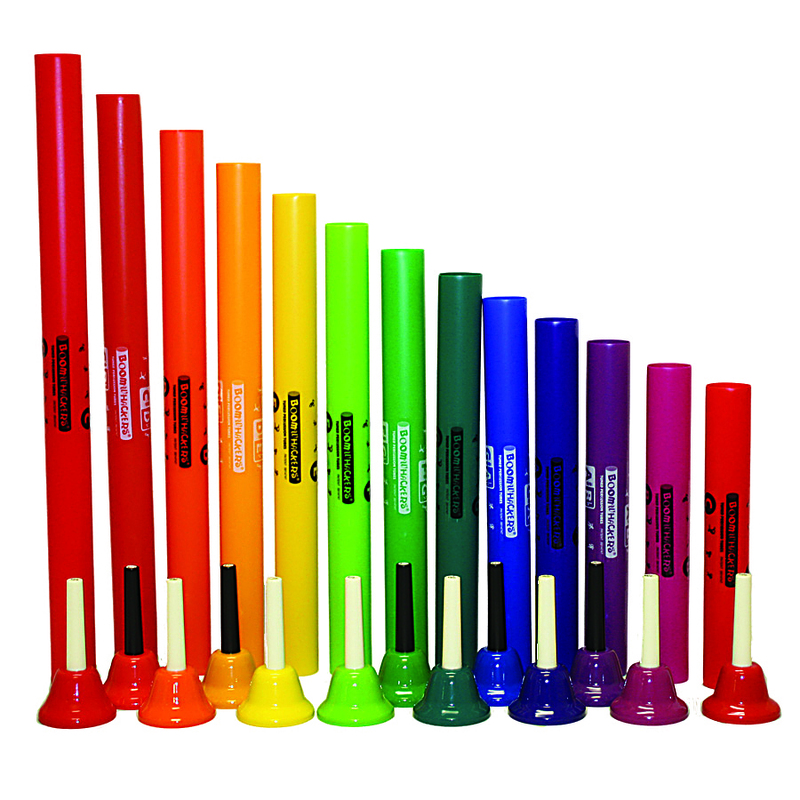 The Chroma-Notes colors make it more fun to learn and play along with Boomwhackers music tubes and Boomwhacker educational materials. Each metal bell is marked with the proper note and number to help children learn the musical scale. Desk bells are struck on the top, making them ideal for young children, special needs communities or anyone with limited mobility. Set contains the 8 notes in a diatonic scale C-c.
Chroma-Notes 8 note Resonator Bells share the same color template as the Boomwhackers tuned percussion tubes. 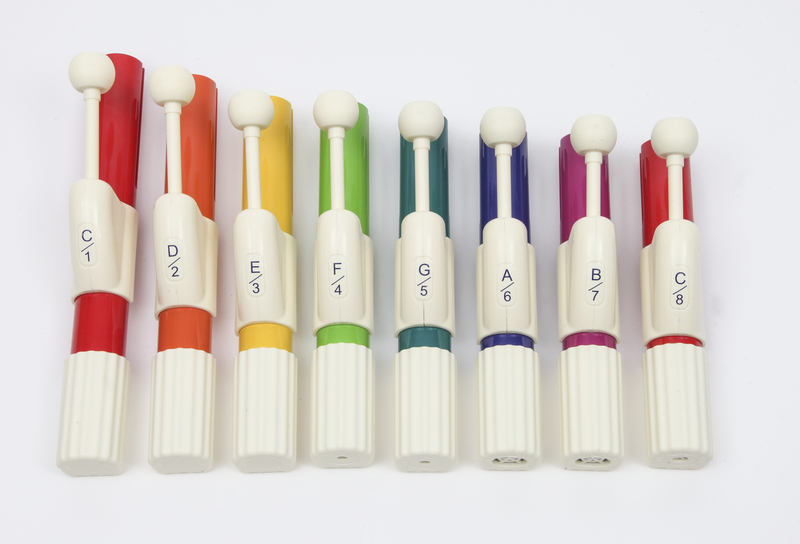 Line bells up to play solo, or separate them for use with small groups. Each bell is attached to a unique tube-shaped base for great resonance, sustain and a deep, rich sound. The set is flexible enough to be used in classrooms as an educational tool, or at home for the sheer fun of making music!! Comes in a convenient, durable carrying case (16" X 12" X 3") and 4 pairs of mallets for multiple players. Age 3+. Chroma-Notes 13 note Resonator Bells contains the full chromatic range from C-c and share the same color template as the Boomwhackers tuned percussion tubes. 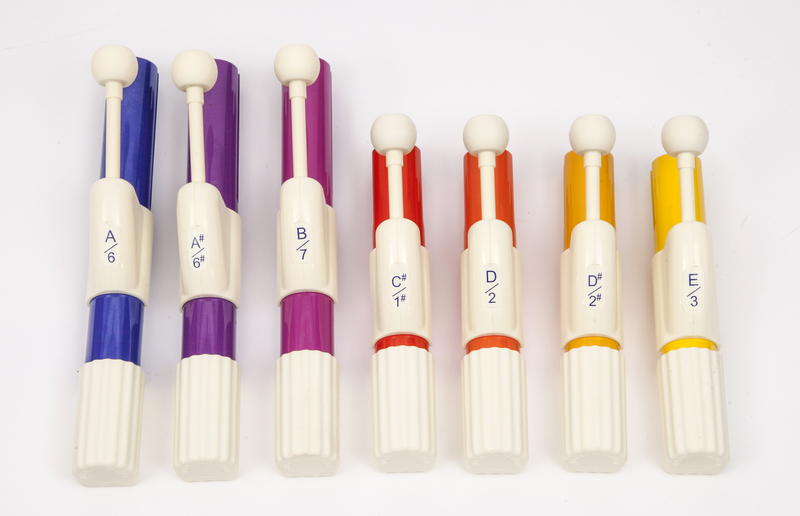 Line bells up to play solo, or separate them for use with small groups. Each bell is attached to a unique tube-shaped base for great resonance, sustain and a deep, rich sound. The set is flexible enough to be used in classrooms as an educational tool, or at home for the sheer fun of making music!! 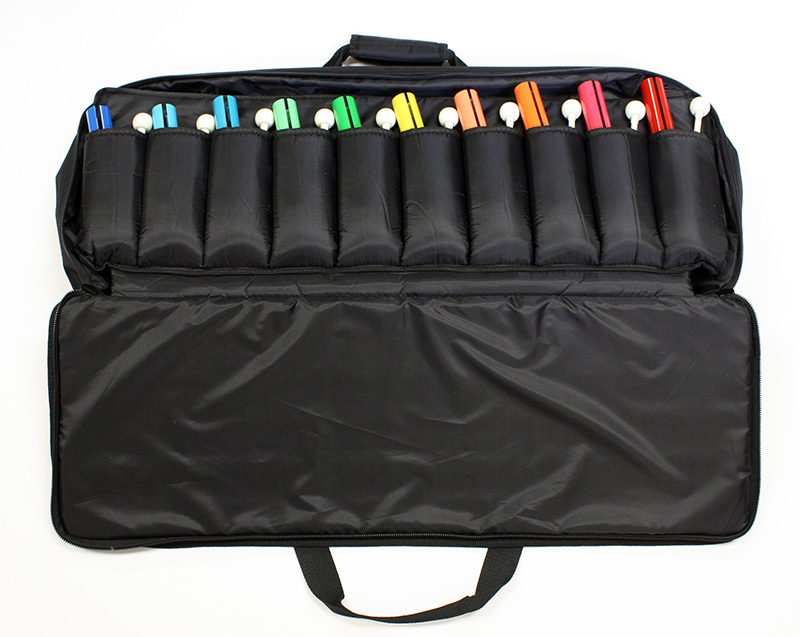 Comes in a convenient, durable carrying case and 6 pairs of mallets for multiple players. Age 3+. 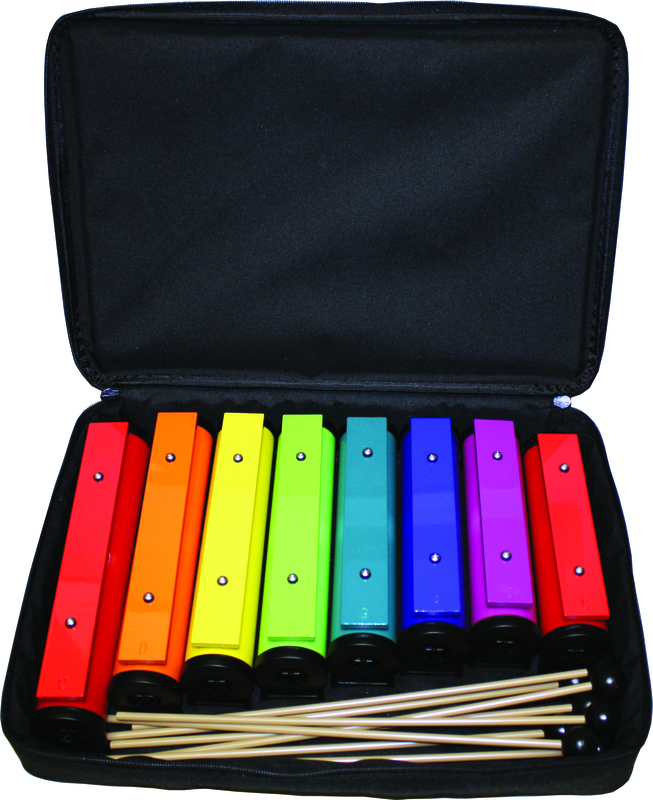 New and innovative student handchime set in Chroma-Notes colors create a beautifully resonant sound while providing a unique alternative to traditional handbells. With a rounded sound chamber and lightweight materials, these chimes are easy to hold and play for extended periods of time. Set included 5 chimes, C#, D#, F#, G#, A#, in a portable, durable case. New and innovative student handchime set in Chroma-Notes colors create a beautifully resonant sound while providing a unique alternative to traditional handbells. With a rounded sound chamber and lightweight materials, these chimes are easy to hold and play for extended periods of time. Set included 8 diatonic chimes in a portable, durable case. Carrying case for 20 hand chimes. Padded pockets to keep each chime secure. © 2011-2019 Chroma-Notes™. All Rights Reserved. "Boomwhackers" is a registered trademark of Rhythm Band Instruments LLC.